Paul O’Rourke is a successful, middle-aged dentist, a technophobe addicted to technology and an avowed atheist yearning for religious community. He has few passions; he was an avid fan of baseball, specifically the Boston Red Sox, but became disillusioned with the team when they won the 2004 World Series and lost their underdog status. His hobbies – golf, the gym, indoor lacrosse – are short-lived, principally because he can’t bear the thought of spending the rest of his life’s spare time on any one activity. Then a website is set up for Paul’s dental practice that describes Paul as the follower of an ancient religion, Ulmism. Then comes a Facebook account, then a Twitter feed. ‘And what began as an outrageous violation of privacy,’ the book’s blurb reads, ‘soon became something far more soul-frightening: the possibility that the virtual ‘Paul’ might be a better version of the man in the flesh.’ The marketing tactic is evident: appeal to the heightened modern anxiety surrounding Internet identity theft; exploit the increasing tendency to define self-worth through obsessive comparison with others’ calculated online profiles. It prompts the potential reader to imagine that a false, virtual ‘you’ becomes more successful than the real you, and to recoil in horror: think Dostoevsky’s The Double for the Digital Age. 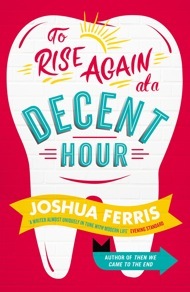 But the blurb’s summary of Joshua Ferris’s To Rise Again at a Decent Hour is intentionally misleading, or at least incomplete. The online ‘Paul’ is not a ‘better’ man, but rather a more devoutly religious one; the novel proves to be more about faith than technology, a fact that the UK cover (above) curiously seems to distance itself from (US cover below). Much of the novel consists of Paul reminiscing about two former loves: Sam Santacroce, a Catholic, and Connie Plotz (also Paul’s current office manager), a Jew. In each case, he fell for the family as much as the woman herself, wishing to surround himself with her relatives despite any religious differences. The only thing holding him back from conversion seems to be his inability to believe in a benign God. Ulmism might be a suitable fit for Paul, then: it is a (fictional) religion, consisting of proven descendants of the Amalekites, for whom a central teaching is that they must doubt God’s existence. Ulmism has the potential to be used as a paradoxical, Vonnegutian tool with which faith can be wittily and revealingly examined – some might argue that Ferris does achieve this – but at its midpoint the novel takes a strange turn that undermines its success, not so much plot twist as register shift. The novel plays out like a visit to the dentist’s: Ferris eases the reader in with a few jokes (however darkly comic) before getting down to serious business. And when the seriousness does come, so does an increasing number of tedious, faux-biblical passages from Ulm scripture and a plotline that never really finds its feet. To Rise Again originated as a detective story called The Third Bishop, started in 2004, but when Ferris returned to it in 2010, the novel retreated towards his more familiar territory of satirising modern society. As a result, it reads as if it were caught awkwardly somewhere between the two. However much interest might wane for some readers during To Rise Again’s latter half, though, the vivacity of the novel’s first half certainly often impresses. And besides, the main draw of To Rise Again is not its plot but its protagonist: Paul is not a sympathetic character, but an entertaining and well-written one. A classic victim of male, middle-aged malaise, Paul’s morbid, contradictory mind is laid out highly effectively in the novel’s opening pages, which contains many of its best quotations. Alongside the opening paragraph at the head of this article, Ferris’s descriptions of open cavities as the ‘eyes stones of skulls’ and lone molars that ‘stand erect as tombstones’ are typically effective at tuning readers into Paul’s way of thinking. Paul’s dialogue with older generations can be tellingly one-sided; during conversations with his fellow dentist-worker Betsy his speech is often strikingly absent from the narrative, leaving us only with Betsy’s insistent questions and the repeated phrase, ‘I told her, she said …’ The self-centered virtual communication of the Internet and phone, which Paul calls the ‘me machine’, is here mapped onto reality; the technology so often touted as aiding communication in fact leads to its disintegration. It is perhaps not surprising that To Rise Again is being treated as the underdog for this year’s Man Booker Prize; Ferris’s novel made the shortlist ahead of stronger candidates including David Mitchell’s The Bone Clocks, Paul Kingsnorth’s The Wake and Richard Powers’ Orfeo. That said, this year’s judges have already provided a few surprises, and, despite its top-heavy nature, To Rise Again at a Decent Hour remains an amusing and sporadically brilliant novel. 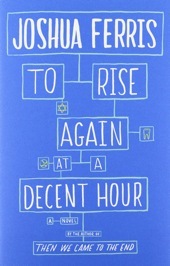 ‘To Rise Again at a Decent Hour’ is available from most bookstores, RRP £16.99. An excerpt is available from Joshua Ferris’s website.